One of the greatest artefacts of the Forbidden Lands is Stanengist, the royal crown known as ‘The Hanging Stones’. In this crown were mounted six rubies, each the elf stone of the first six elves of the Forbidden Lands who planted its trees, cut the beds through which the rivers flowed, and gave homes to its animals. From their position upon the crown, these elves could maintain a watch over what they had wrought and give advice to their descendants who wore the crown and so keep the lands intact. When several of the rubies were stolen, the land was weakened and with the coming of mankind to Ravenland, the land would ultimately be sundered with the rise of the Orcs and the unleashing of demons by the arch-sorcerer, Zygofer the Spellbinder. Walled off for centuries, the Blood Mist that has long settled upon these Forbidden Lands has recently lifted and men and women of all races have flooded into a realm untouched by their hands for centuries. They are not valiant souls, but scoundrels, treasure hunters, vagabonds, adventurers, fortune seekers, setting out to make their mark on the new land—there are dungeons to be plundered, great treasures to be found, and strongholds to be claimed! The starting point for such expeditions are the legends, the lore, and the rumours that weft their way across the land, from ear to ear, and so it is with new word of Stanengist. It is said that visions have been seen of the lost rubies and where they lie. Locate these rubies and Stanengist itself and then remount them in the crown and it is said that whomever places it on her head shall according to legend gain the power to rally all kin and rule over the Forbidden Lands. There is truth in every legend, so is there a band of adventurers and fortune hunters brave enough, resourceful enough, foolhardy enough to locate all of the lost elf stones and so claim the crown of the Forbidden Lands? This is the set-up for Raven’s Purge, the first campaign for Forbidden Lands – Raiders & Rogues in a Cursed World, the ‘Retro Open-World Survival Fantasy RPG’ published by Free League. Published as part of the roleplaying game’s Kickstarter campaign, Raven’s Purge is an epic eight-part campaign with an open structure built around eight locations and a finale at a last, ninth location. The player characters are free to visit any of the first eight locations in any order—and need not even visit them all—in order to gain sufficient information to go to that last location. 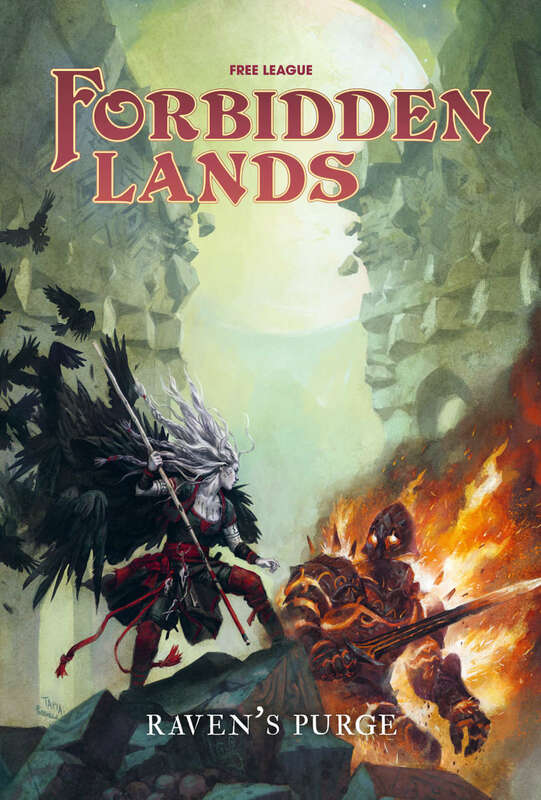 This reflects the open play style of Forbidden Lands, in which the players and their characters are explorers, travelling across territories which have been cut off for centuries and of which they know little except legends. Such legends serve as hooks, pushing the characters to visit the setting’s adventure sites—villages, castles, and dungeons—and pulling them into the region’s history and secrets, often revealing the dark truths of lands that have been under a blood mist and demon-infested for centuries. Raven’s Purge is presented as a toolkit to run its campaign as much it is a campaign itself. This is because the campaign is freeform in structure rather than linear, so the player characters are free to roam where they will, visiting which of the eight locations they want, and in what order they want. Now this means that the campaign is more of a challenge for the Game Master to prepare to run because it is primarily player directed. To offset this, the Game Master can nudge the player characters in certain directions, using the legends given for each of the artefacts which appear in the campaign and the various NPCs who have an interest in Stanengist. As a toolkit, Raven’s Purge gives a complete history of Stanengist, including its missing rubies and details the nine key players from the Forbidden Lands with an interest of obtaining in gaining the missing Elf Stones and Stanengist, before detailing the eight (plus one) locations which make up the campaign. Now the Game Master should be aware that the nine key players are not just the key players particular to this campaign, but the setting for the roleplaying game itself. Once the player characters get involved, their actions, the alliances they forge, and the enemies they make will have a profound effect upon the Forbidden Lands. Some of those effects, the consequences of the player characters’ actions across the campaign, are discussed in the book’s last chapter, ‘Aftermath’. This capacity to fundamentally change the political landscape ties back into the ethos of the designers of Forbidden Lands—that each Game Master’s campaign is going to be different and that the outcome of the player characters’ actions will be different in each campaign, essentially stamping their combined ‘legacy’ upon the Forbidden Lands. The campaign’s adventure locations include the centre of the region’s slave trade, a party venue for ogres, an orc city, an abandoned mine, and more. Each location is accorded a chapter of its own and organised into the same format. This begins with a description of what the player characters see before detailing the location’s background, how to get there, the legends associated with it, its locations, monsters and NPCs, and possible events that might play out there once the player characters arrive. The ‘Getting There’ section typically gives two or three ideas, many of them NPC encounters before reaching the location itself that are tied into possible storylines given in the ‘Events’ section. If there is a weakness to the ‘Getting There’ section, it is that across the eight locations, the ‘encountering an NPC just outside a location who wants you do something in said location’ does become something of a cliché and the Game Master may want to adjust as necessary. That said, all of the given NPCs should be fun for the Game Master to roleplay and the events themselves are varied. The Game Master can also expand upon Raven’s Purge by adding two of the adventure locations from the roleplaying game’s ‘Gamemaster’s Guide’—Weatherstone and Vale of the Dead. These can either simply be added to the eight given in Raven’s Purge, or if the Game Master has already run them, use them as a springboard into this campaign. Either way, they could be used as the starting point for playing Forbidden Lands – Raiders & Rogues in a Cursed World. The structure of the Raven’s Purge campaign—a series of nodes linked by legends at the centre of which is the finale—is also open enough such that a Game Master could design locations and adventures of her own to run in addition to the campaign itself. Physically, Raven’s Purge matches the style and quality of both the ‘Player’s Manual’ and the ‘Gamemaster’s Guide’ for Forbidden Lands. Although it does not have the faux leather covers of the two core rulebooks, this is another sturdy hardback done in black and white on buff pages. Again illustrated in pen and ink throughout, it has the look and feel of a roleplaying game supplement from decades ago. The artwork, primarily drawn by one artist, is excellent, as is the cartography, again more illustrations than maps, is also good. It should be noted that the fantasy of Forbidden Lands is definitely grim and gritty with a mature tone. In a great many ways, Raven’s Purge is the companion to the boxed set of Forbidden Lands. Together, the ‘Player’s Manual’ and the ‘Gamemaster’s Guide’ for Forbidden Lands – Raiders & Rogues in a Cursed World set up the Forbidden Lands as they are now, with Raven’s Purge expanding up that. Raven’s Purge though then provides the means for the player characters to not only interact with the great and the good—actually, mostly not good as there are shades of grey in every NPC—of the Forbidden Lands, but also truly change its political landscape. Raven’s Purge is a grim, gritty open campaign in which the future of the Forbidden Lands is placed in the player characters’ hands and what they do and what they decide will be their legacy in the Forbidden Lands. Fria Ligan makes old school great again.